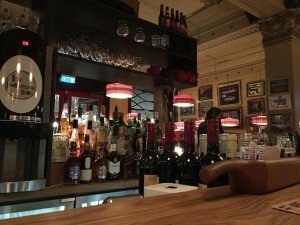 I had a bit of a lie in on Tuesday morning before heading back to the coffee shop I visited yesterday, grabbing another americano and writing up my blog. Then I had two options for what I was going to do with the rest of my day, and it was all down to weather. I’d either head off to drive Iceland’s “Golden Circle” or if the weather was going to be poor, I’d visit a swimming pool in Reykjavik then a mall. 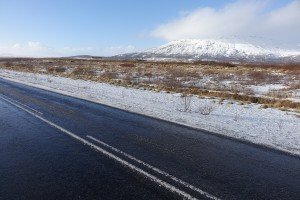 The Iceland Road Service map of road conditions showed roads just to be ‘slippery’, and looking up wind speeds on the Met Office website they didn’t seem to bad. So I decided to go with the former, packed up my stuff and hit the road again. The Golden Circle’s a really touristy thing to do. I’d say most people visiting Iceland probably go to the Blue Lagoon, and take a tour of the Golden Circle. 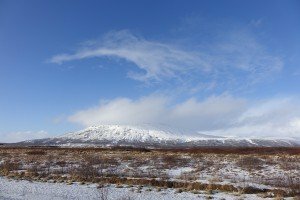 There’s three main sites on the road – Þingvellir National Park, where can you see where a canyon formed between two tectonic plates. 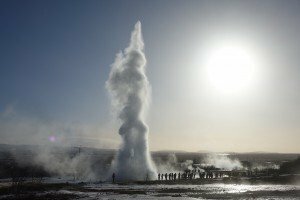 Then there’s Geysir where you can see a geyser, and then Gulfoss, a 32 metre waterfall split over two levels. You can get a tour bus right round the whole thing (there are loads of operators offering them), or you can just drive yourself, which is what I decided to do. 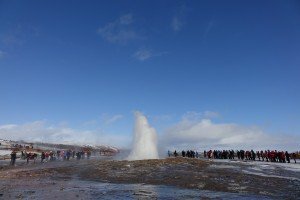 I saw LOADS of tourist coaches on the way, but visiting Iceland and not doing the Golden Circle seemed just a bit wrong! Thankfully the sun was shining as I headed off – and once more, the scenery was amazing. As the roads were free from snow, it meant I had a bit more time to take it in too. It had taken me just 40 minutes from the centre of Reykjavik to get there. 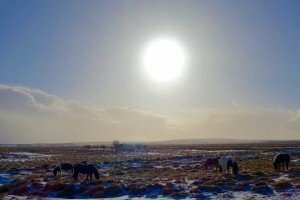 Next, it was back in the car as I headed towards Geysir – the next stop on the circle. I stopped along the way a couple of times to get some pictures as well. 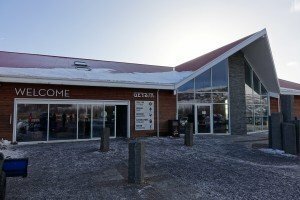 By now, I only had about a quarter of a tank of petrol left, so I stopped at a petrol station at Laugarvatn, where I watched an American lady try to open her petrol cap for ten minutes, hogging the only pump, before I jumped out and managed to get it off in less than 20 seconds. Rare for me! I grabbed a quick hot dog inside the petrol station, and filled up the car. Three quarters of a tank for around £18, which I thought was pretty good! Heading on, I arrived at Geysir. The first thing I spotted was an enormous car park, so I knew I was in the right place. Beside a small crumbly looking hotel and two tourist shops and restaurants, I parked up. It’s a short walk across the road to a path that leads you to the big geyser, and past lots of bubbling, sulphuric smelling small ponds. And that path was treacherous! 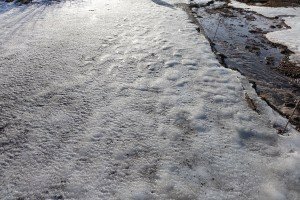 I saw one person come a cropper – little knowing I’d be doing the same later on that day, but not due to ice! 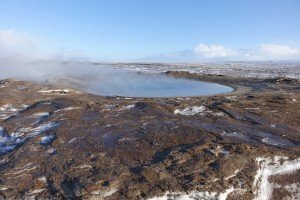 Pretty soon I came across the main event – a massive steaming hole surrounded by a rope, surrounded by tourists waiting for the next big blow. I didn’t have to wait long before it happened. I was a bit like meh…. but then a much bigger spurt came about three – four minutes later, which I managed to get on video. That is pretty impressive, right?! There were lots of steaming pools around the place – with signs on ropes warning that their temperatures were around 100 degrees. 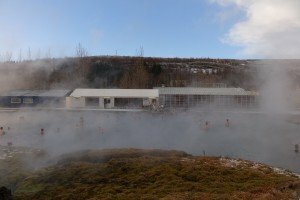 After one more look at the big one, I decided I’d really seen everything there was to see, so taking care not to slip, headed back along the path to my car, and dropping a couple of hundred krona in the small donation box (there’s no entrance fee to Geysir). 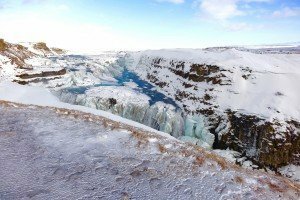 Gulfoss, the waterfall, is only a ten minute drive from the geyser, so although I had another place I planned to visit, I decided to plough on, just so I could say I’d seen it. I pulled up in my car, and walked over to a vantage point and got a couple of shots. It was pretty amazing looking, but I think I’d had my waterfall expectations set in Brazil earlier in the year! There was a set of steps leading up to a higher vantage point and a small cafe, but I decided not to bother. I didn’t want to be driving back to Reykjavik in the dark, and I still had one place to stop off at before I returned home. 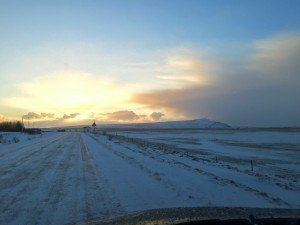 Turning off the main Golden Circle road, I started heading South – to Flúðir – a small town. I must have passed maybe three cars on the 30 minute drive from Gulfoss, so I knew I was a bit off the tourist treck. I wasn’t sure trusty Google Maps had my back when it told me I’d pulled up at my destination. 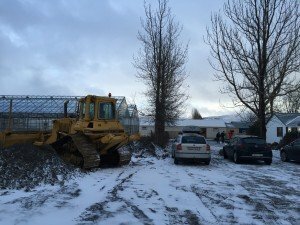 It was a car park on what looked like an industrial estate. 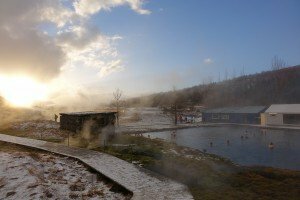 I’d mentioned when I’d been in the tourist office the day before that I fancied visiting a hot spring pool that wasn’t the Blue Lagoon (which I’d be doing later in the week) – something a little off the beaten track and a bit less touristy. She pointed me in the direction of Flúðir’s Secret Lagoon or Gamla Laugin. Spotting a busload of school kid tourists getting on a coach soon after I arrived had me suspecting this is not strictly a secret! Annoyingly I’d forgotten my swimming gear, so I ended up paying 3,800 Krona for entrance, a towel and a swimsuit – about £20 at the time of writing. That picture was taken after I’d been in – when I was in the lagoon, it was snowing, which made it a bit magical. The water was lovely and warm, and the bottom of the lagoon was covered in like tiny grains which were really comfy. Be warned though there’s a couple of boulders in there! There were only about thirteen of us in the whole lagoon when I first entered, so it was really relaxing and peaceful. Everyone was just chilling out really. After about 45 minutes, I decided to head back inside and head back to the city. Which is where everything went slightly wrong. After a quick shower, I was opening my locker when I began to feel really weird. I remember someone asking if I was ok, and saying yes. Then nothing. Then the next thing I know I’m lying flat on my back on the floor (and remember how small the changing rooms were!). I guess I must have fainted. I don’t know whether my blood pressure had got low after spending too long in the lagoon, or whether I was dehydrated, or I just hadn’t eaten enough that day. But it took me a good ten minutes just sitting on the floor feeling stupid to recover. Some English people made sure I was ok and one man gave me a drink of his water (thank you! ), but it was really weird. I felt just awful. I’ve never fainted before either! I don’t even know how I ended up on the floor. I must have just slowly sank as I didn’t bang my head or anything judging by the lack of pain today! But it was mortifyingly embarrassing – particularly as I was only wearing a towel 🙁 That thankfully seemed to stay in place. After drinking a lot more water, and taking some more snaps of the surroundings of the lagoon I headed back to Reykjavik. It started out a stunning drive once more (mainly along Route 1, which I’d driven on the way back from Vik). Then, after stopping off in Hveragerði to grab a wrap in the supermarket with a drunk looking pig for its logo (just to get some fuel in me just in case! ), as I was climbing a hill out of the town, the weather took a dramatic change for the worse. All of a sudden you could hardly see in front of you – everything was just white with a mix of snow and fog. We were driving at about 20 kmph in places, when the speed limit’s 90. It was pretty hairy for a good ten minutes, and I was to discover the next day that an hour later, the road was closed by the emergency services. So I was kind of lucky not to be stranded! 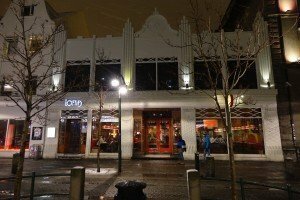 I got back to Reykjavik at around 6.30, and decided I was definitely going to eat out as it was my last night in the city. I wasn’t really in the mood for someplace fancy (and didn’t have the money for that either) so walked for 20 minutes to get to The Laundromat Cafe (actually a Danish import) which I’d read about. It was a good choice. It was pretty packed, but I managed to grab a seat at the bar, and ordered a glass of wine (gonna go crazy!) and a BBQ Chicken sandwich. It was tasty, and more to the point, it wasn’t too expensive either. With another glass of wine and a diet coke, it came to about £28, which I thought was decent enough. Stepping outside, the wind was coming right at me, driving snow into my face. I pulled my hood up and headed back to the apartment, where I sat and watched this week’s Happy Valley before hitting the sack. It had been a long, but fun day (apart from the fainting). Tomorrow I’d be leaving Reykjavik and my great apartment behind. I’d really be tempted to drive it yourself rather than taking a tour – your time’s your own then and you can decide how long to spend at each point. 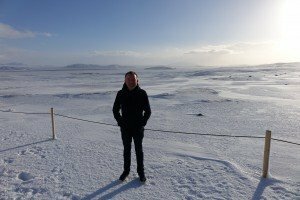 If I’d headed straight back to Reykjavik after Gulfoss, the last stop, I reckon I’d have done the whole thing in about four and a half hours. Do check the road conditions and weather before heading out. 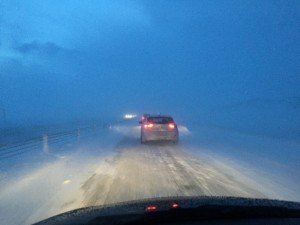 A taxi driver told me he wouldn’t drive in winds above 18 metres per second (note that’s what wind speeds are measured in in Iceland). They say the weather can change instantly here, and it’s true – as happened to me on the way back. Google Maps is your friend if you’ve picked up a Sim card when you arrived – just put in Thingvellir for the national park (it’ll come up Thingvellir US-EURO for some reason), Geysir, Gulfoss, and then Secret Lagoon if you fancy going there. It’ll take you right to each spot. 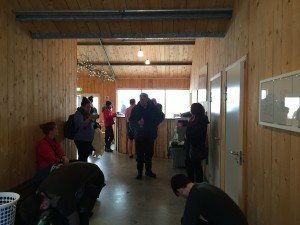 Fill up your car before you head out – or fill up in Laugarvatn – it’s about an hour into the tour, and it’s the last petrol station I saw until Selfoss on the way back from the Secret Lagoon. 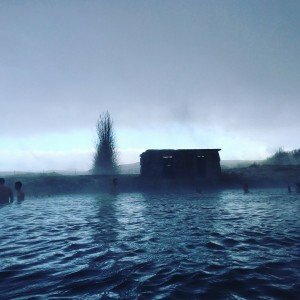 Lovely post, I’m going to Iceland with my family next month. Your post was very enjoyable to read and I hope you weren’t too embarrassed with the changing room incident! Thanks! And I’m over it 😉 Hope you have a great time!